On several occasions, I was suggested to provide a method for flamenco guitar, but given the breadth of the subject and its complexity theory and practice I did not have ever heard. Moreover, as a student, I was always rather disappointed by the various handbooks available that address all issues of this fascinating discipline were, in most cases, too hasty and not very comprehensive. Today, however, with the popularity of audio-visual material, it has become easier to find the valid collected and examples explaining how to make a good rasgueado or how to learn the compassion of various kinds. So my interest is directed towards those aspects of performance that are sometimes more difficult obstacles, when dealing with the repertoire of the great composers of the toque. She was born with this in mind this series of studies and exercises (intentionally linear in the writing and in the shades easier) voted to the development of the technique of arpeggios, alzapua, darts and tremolo. Some of them are used exclusively for educational, others are real issues that sometimes I reuse the same in my work. The proposed order of difficulty with non-progressive and can also be approached by guitarists from a formation of the classical type. With the hope of meeting for students and fans, I invite those who are willing to undertake this trail, to practice for a long time and with the help of the metronome studies that I proposed. As in any other discipline musical results are obtained by assiduous study and constant practice daily! 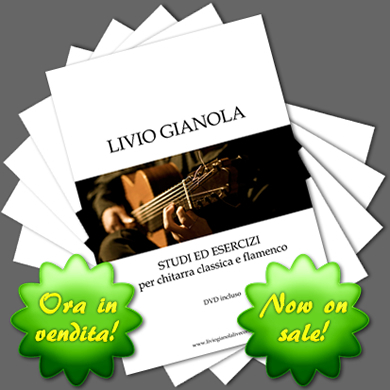 The book is available only in digital version for download and contains standard notation and tabs.